What’s holding Bangladesh back from implementing the CHT accord? The status quo of the CHT crisis has become a ‘sticky’ matter for Bangladesh. The government, both under the ruling and the opposition parties, have taken a very similar approach of not recognizing the indigenous people in the constitution. This implies GoB’s unwillingness to provide special privileges to the country’s tribal minorities as indigenous population. Over a decade after the CHT ‘peace’ accord, the abysmal slow process of its implementation can only suggest two possible reasons behind the delay: either the GoB does not want to implement the peace accord or it doubts the political wisdom of the accord, that it only wants to take a passive approach of dawdling. However, neither stance can produce anything but an intractable crisis, which can only destabilize the region unnecessarily. The conventional wisdom of military pundits is to establish its authority in a disputed region and use force to quell any unrest. The practice and record of Bangladesh Armed Forces in the CHT testifies this very well. As such, it is not surprising at all that the presence of military with an excuse for ‘security’ has become a severe contentious issue in the CHT. The underlying security dilemma is bound to spiral into an ever worse scenario. As a consequence, one after another tussle in CHT in every year has only been aggravating this crisis. Furthermore, the GoB has taken a simultaneous political sponsorship of settlers in the CHT with downright denial of such policy. The scarcity of land is the only excuse that is manufactured behind this ‘normal’ migration. The fact is that when most of the arable land in CHT is already submerged under the Kaptai Lake and only the indigenous people have been well accustomed to the jhum cultivation, the disillusion of migration for a promised land only fuels anger among the settlers. This is further accentuated by growing competition for land between the settlers and the indigenous people. Not surprisingly, after just over a year of the incident in the villages of Baghaihat and Khagrchhari, another fight erupts in Ramgarh in mid-April this year. Subsequently what follows is a blame game, which is another facade that veils the true evil which is nothing but the sticky status quo of the GoB policy regarding the CHT. The misery it inflicts among both the settlers and the tribal communities questions the very pillar of the nation’s conscience. The poor victim’s hopeless fate is strangled into oblivion by the very policy of the GoB, or perhaps is gagged into another crisis — yet to unfold! It is a pity that the GoB fails to realize the ineptitude of its policy when years to date, it only kept the crisis alive, if not made it worse. First, there should not be any question in the wisdom of the CHT Accord. It is the best possible alternative to a protracted low level insurgency in the CHT. The wisdom of the CHT Accord is that it is a political solution, not a military one. With the disarmament process of the Shanti Bahini, Bangladesh was fortunate to avert an intractable insurgency. The geography of the CHT demonstrates the impossibility of a successful counter insurgency (COIN). Moreover, the methods and records of the COIN itself by various military forces, not to mention the neighbouring India’s failed effort against the Maoists, only demonstrates how arduous and perennial task it is. It drains a nation’s resources, corrupts its morals and conscience, puts enormous stress to numerous lives, and leaves a black hole in anything it takes prides for its history. Even the US armed forces encountered enormous difficulty in COIN operations in Iraq and Afghanistan. 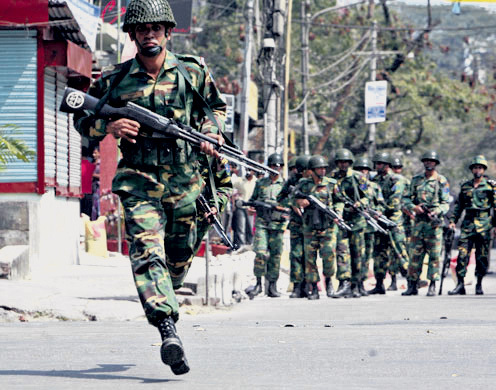 Also, Sri Lanka’s precedents of excessive use of force against Tamil militants is not an alternative either to the CHT case which can result in possible war crimes. It will undo the pride every Bangladeshi takes into its history. Therefore, there is no alternative to a political solution. However, the GoB appears to provide more importance to what the military elites have to say. The minutes from the ministerial meeting held in January demonstrates that the GoB is more keen to listen to the military commanders in curbing access to the CHT area. Their saleable excuse is ‘the foreigners’ hidden agenda’. The government must realise that as long as it has a clear, strong and effective policy and is adamant to implement it with credible initiative, no quarter can exploit the CHT issue whether they be external forces or the internal ones. This facade of blame game of ‘hidden agenda’ has to stop for national interest. Furthermore, the recent development of natural gas exploration in the CHT region is very relevant to this topic and need some elaboration. A very recent report by the Financial Express Bangladesh illustrates the Chinese state companies’ interest in gas exploration in the CHT region. The scepticism that the GoB’s ineffective policy of status quo is to maintain its command over the CHT’s natural resources — yet to be explored, will soon become obvious in every quarter. Marginalizing ethnic minorities for natural resource has set grave precedents from Nigeria, Sudan, Kurds in Iraq, Timor-Leste to the obvious brutal history of former colonial powers. Also, in very few cases natural resource became a boon to its country’s development when that country is still struggling to develop economically. The natural resource being a ‘resource curse/trap’ for the developing world has already drawn considerable attention. There is reason to be concerned that how much the people of Bangladesh can actually benefit from the natural resource revenue when the practice of corruption is endemic in the country. Bangladesh is not even a member of the EITI (Extractive Industry Transparency Initiative) for a transparent and accountable exploration and utilisation of natural resources by the government and the extractive companies. Moreover, China’s policy of ‘no question asked’ for exploiting a country’s natural resource does not serve positively for that country. This is well obvious from China’s practice of resource exploitation in Africa. The apparent ‘lucrative’ deals with the Chinese state companies without such mechanisms of transparency and accountability will only accentuate the GoB’s perverse interest to use force to maintain its command over the CHT region. The 2nd May press release by the CHT Commission, which shows the unnecessary and infringing practice of intimidation by the NSI agents at a media workshop on CHT issue, already provides the snippet of more possible encroachment in future by the military quarter on the civil society. This has to stop immediately if the GoB is sincere to establish and consolidate peace in the region. Finally, for any political solution to be an effective and a sustainable one, it has to be a win-win solution. The CHT Accord is indeed one such political solution. It accepts many demands by the indigenous people, albeit it falls short of giving them regional autonomy. It assures land rights, self-governance and practice of their customs. On Bangladesh state’s end, the accord promises sustainable peace and stability for the whole region. Moreover, it ensures security for Chittagong being a crucial port adjacent to the CHT area. However, the success of the accord’s implementation lies mostly on settling the land right issue for the indigenous communities. This is a very sensitive matter but an imperative one to pave the way to greater stability for the region. As such, the GoB has to demonstrate an honest willingness and take effective measures to stop sponsoring settlers indirectly and furthermore, craft a consensual deal between the existing settlers and the tribal community. The GoB must realize that there is no alternative to that and the more they loiter redressing the land issue, the more adverse it will get in future. The GoB’s ignorance will turn the competition for land more aggressive, ending in more frequent and bloodier unrest between the settlers and the indigenous people. Frustration and sense of being treated unfairly and unjustly will only stoke the anger further, setting the whole region a perfect breeding ground for armed hostilities. In fact, the current trend of arsons, armed attack and resistance from both groups further testifies that the process has already started. The GoB must accept the fact that any form of unabated injustice to a minority further facilitates perverse interest in its community. It does not help to assimilate them to the greater community through normal social mobility. ‘Force’ cannot be the answer, instead ensuring education and employment is the only way to help them assimilate to the greater economic prosperity. Second, the geography in the CHT illustrates that massive logging and systematic hill-cutting are the only solution to materialize the illusion of promised abundant and untouched land for the settlers to grab. This is neither a practical solution nor is it deserved for environmental reason since it can lead to frequent mudslides, draining of natural resources, destruction of natural habitat and further economic costs. Therefore, it is in Bangladesh’s national interest, that the GoB acknowledges that there exists a settlers problem in the CHT area and takes effective and clear measure to redress it. The situation is still ‘ripe’ to intervene and implement the CHT Accord.